Web apps enhance your website. They add features and abilities that are unique to your website, in the hope of impressing and helping your visitors. The primary reason being to make them want to choose you, over a competitor. What exactly a web app is, can be anything. Some examples have been displayed below in the portfolio. They have been custom built for the clients. A web app can be anything from a simple calculator widget to a full-blown customer log-in portal. Web apps work on all devices: desktop, laptop, mobile and tablet. They also do no need to be downloaded from the app store. They are opened just like an ordinary website. Web apps can also be built with offline support, effectively making them the same as normal apps. Designed to record the service history of mining truck components. Barcodes are on the components themselves and can be scanned by a phone camera. 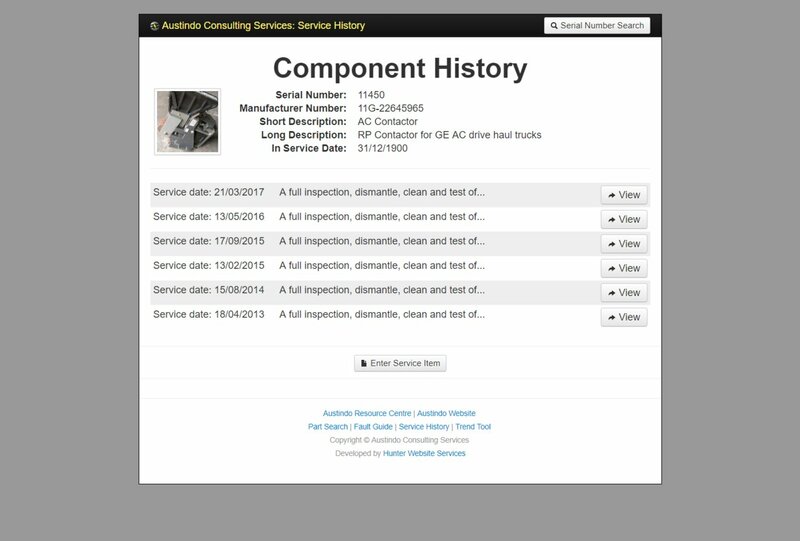 Calling up the service history for that component. 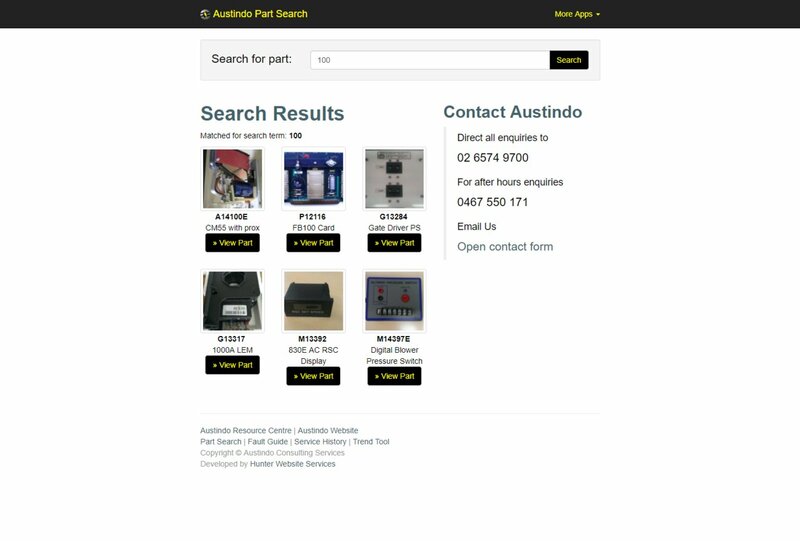 A straight forward database of available parts from Austindo. 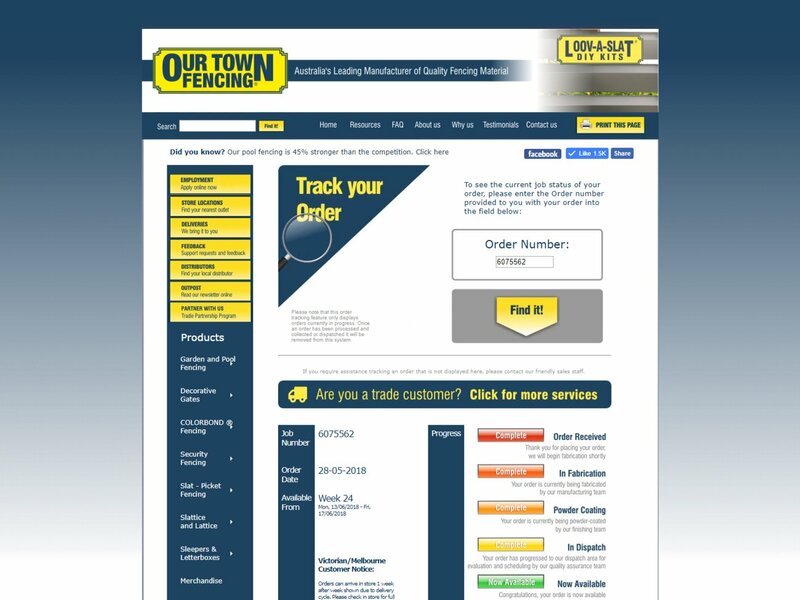 With part information, availability and customised search behaviour. 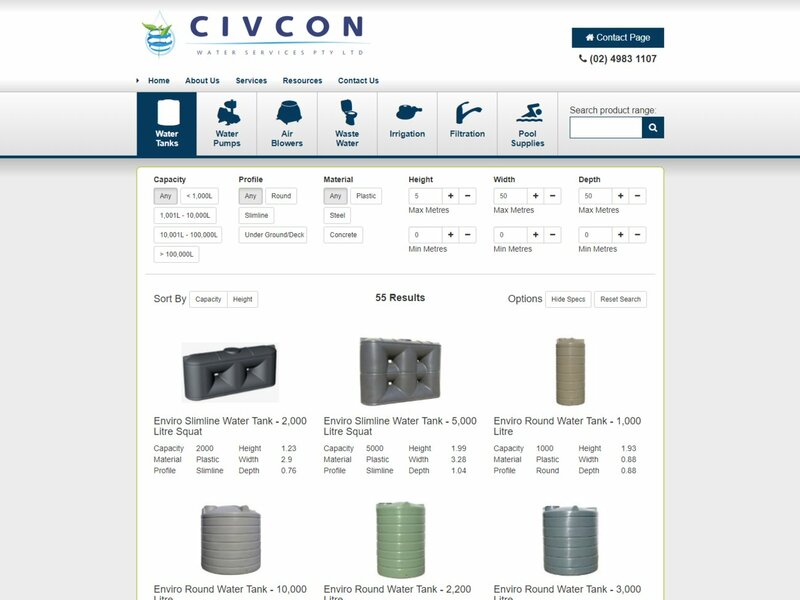 Customers can locate the right water tank by providing dimensions, capacity, material or profile. As much or as little information as they want. Then they are given all of the available options that meet their needs. When advertising the speed benefits of the NBN, it can help to demonstrate how much faster it is. 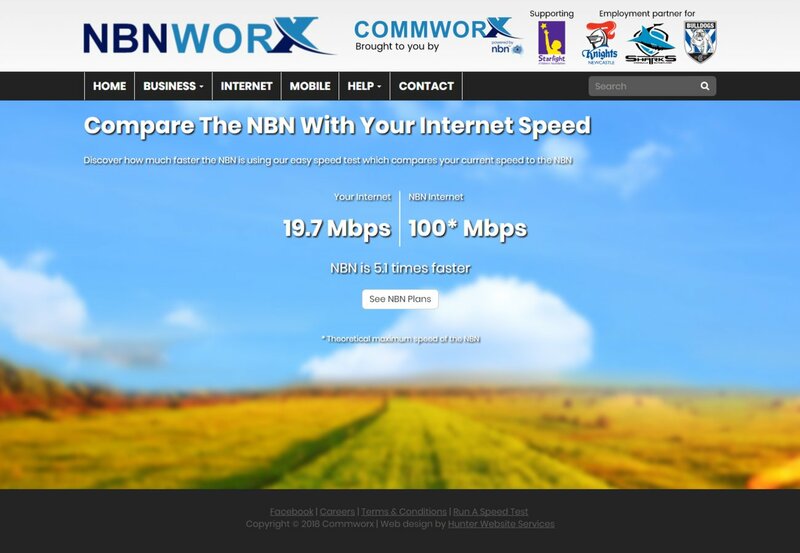 Exactly what this speed tester does for Commworx. It's a challenge to stand out from competition. Without engaging the visitor with something powerful and unique they will move onto another website. Avoid this by making sure they have a reason to stay on your website. Web apps add value and engage the visitor. Retention and conversions go up as a result of the visitor staying with and remembering your brand. Hunter Website Services create custom built web apps specifically to a businesses' own needs. Guaranteeing exclusivity. The web apps that best benefit a business are always unique. What idea do you have that will put you ahead of competitors? Perhaps you don't need a simple web app. Perhaps it's an all new idea or business solution that you need brought to life. Fortunately the same technology and process used for building simple web apps is also used for large scale web development. Technically there is no difference. 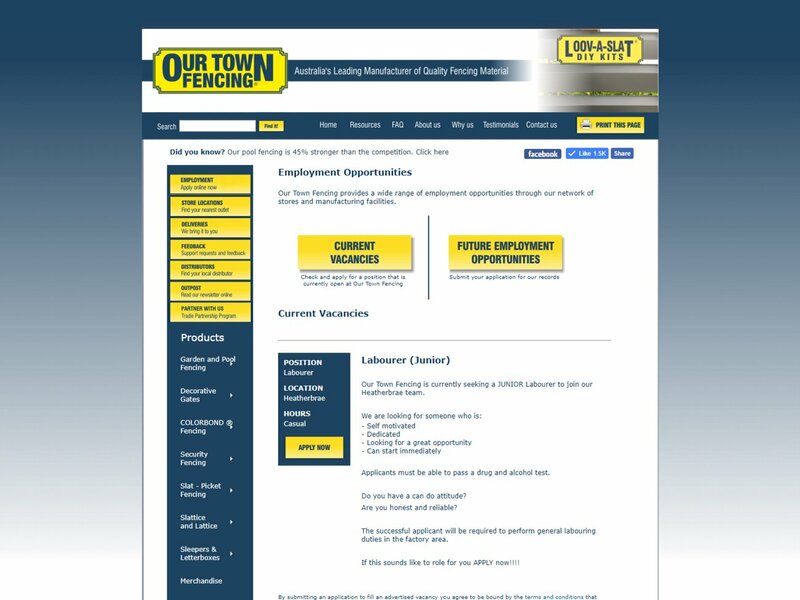 If you're looking for a web developer to work on a new or existing web development project feel free to get in touch or drop by the page below.